While the closing of Michelin-starred restaurants Joël Robuchon and L’Atelier de Joël Robuchon (a few months after acclaimed Restaurant André also shuttered) last year was a big blow to Singapore’s culinary landscape, it provided restaurateurs with the opportunity to reassess their businesses, as well as look into new and inventive concepts to help them stand out. Resorts World Sentosa has brought in acclaimed Dutch chef Richard Van Oostenbrugge, who, with his business partner Thomas Groot, are said to have pioneered the ‘fine casual’ dining experience at Restaurant 212 in Amsterdam. Table65, their first foray into Asia, is an extension of that. Its contemporary European fare is on par with what you can expect from a fine dining establishment without being confined by the strict rules and formalities that often come with such an experience. Instead, diners sit at the counter surrounding the open kitchen, take their utensils from the drawers, and enjoy front-row seat view of the chefs working their magic. “Our goal is for diners not to be intimidated, but to engage in friendly conversations, like in a home kitchen,” says Van Oostenbrugge. Granted, this is not new to diners here. But he was also quick to point out that Table65 isn’t an exact copy of Restaurant 212, as they've employed digital visual applications such as table mapping—not to overwhelm but to “trigger all the senses and give guests a totally different experience”. For example, the amuse bouche of air baguette comes with ‘mushroom soil’ atop a round plate where yellow light appears to slowly creep up on the rim to make it seem like it’s on fire. The same goes for the signature apple dessert on a plate upon which a visual of sun rays is projected. Again, as novel as it sounds, it’s not new in Singapore. Just last year, Stellar at 1-Altitude launched the Dom Pérignon Plénitude Suite—a first for Southeast Asia. The ultra-exclusive space is hidden on the 62nd floor of One Raffles Place and accommodates only eight guests at a time. An experience here commences with executive chef Chris Millar personally greeting you; and through technology such as video vignettes, projections, aroma and music, you’re taken on a multisensorial journey to places such as the French countryside to discover the nuances of making some of the world's best champagne and in essence, get to ‘meet’ the winemaker. All these serve to highlight the delectable food paired with a curated selection of Dom Pérignon bubbly, from its vintage 2009, to the rosé and the magnum champagne 2006. “By marrying the two, we create an ultimate experience in the Plénitude Suite,” shares Millar. That being said, table mapping requires a big investment for business, which is probably why some restaurants decide to dip their toes into it first before fully commiting to it.The latest to leverage on the buzz surrounding such gimmicks is La Brasserie at The Fullerton Bay Hotel Singapore, which will be bringing in Le Petit Chef for a pop-up event from January 28 to February 24. 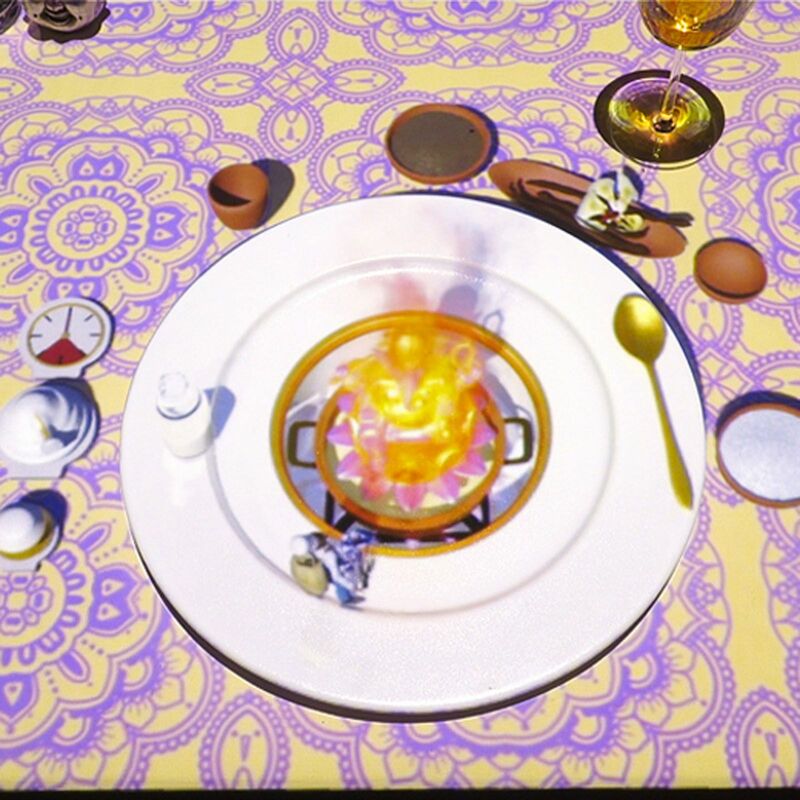 The fictional character dubbed the “world’s smallest chef” will animate the dining experience with engaging storytelling and visual effects projected on the table, before diners tuck into the culinary team’s delicious four-course dinner. Adds Cavaliere Giovanni Viterale, general manager of The Fullerton Heritage: "It offers the chance to enjoy the food on your plate in a whole new manner—it lets you see, hear and experience the story of each dish—often with great humor." But Van Oostenbrugge clarifies that he doesn’t cook for chefs or Instagram. “I just want to create delicious food that people would appreciate and come back for.” Such theatrics aside, it’s what truly matters if you want to survive the volatile industry.